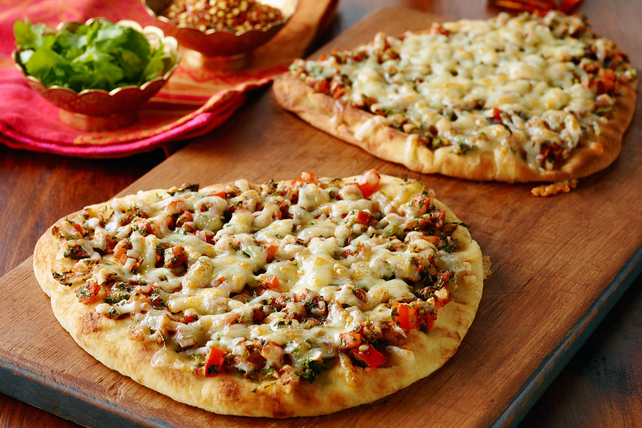 KRAFT 4 CHEESE ITALIANO Shredded Cheese make the bruschetta topping on this pizza deliciously cheesy! Place naan in single layer on parchment-covered baking sheet. Bake 10 min. or until firm and lightly toasted. Remove from oven. Turn oven to broil. Combine all remaining ingredients except cheese; stir in 1/2 cup cheese. Spoon over naan; top with remaining cheese. Broil, 6 inches from heat, 5 min. or until cheese is melted. Cut each naan into 4 slices. Add 1 Tbsp. sliced black or green olives to the bruschetta mixture before using as directed.